What is a winter salad? It’s the dish perfect for when you want the freshness of spring but the chilly temperatures still make you longs for comfort food. This Warm Quinoa Salad will satisfy those longings on a cold day. As we enter the “spring territory” with the daylight savings, our brains switch to warm, green, fresh. But what happens more often than not is that we are still stuck in the thick of winter with its chilly temperatures and snow. To make a compromise for these conflicting desires, try Warm Quinoa Salad. 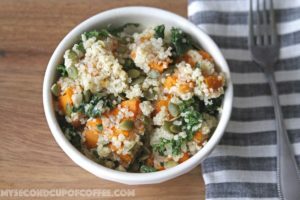 Warmth of quinoa and sweet potatoes and green freshness of kale are truly the opposites that bring peace and comfort to my salad loving soul on this chilly day.